It usually comes in small-sounding and unlarming increments. But add up enough of these increments, and pretty soon you have some real numbers. Today was another one of those, and it hit a huge milestone. The Energy Information Administration released its new set of weekly petroleum data, including inventories. During the week ending August 19, US crude oil inventories rose by 2.5 million barrels to 523.6 million barrels. Oil bulls weren’t tickled: West Texas Intermediate fell 2.8%, settling at $45.77. This rise was, once again, “unexpected,” as the media put it. Analysts had expected a drop of 0.5 million barrels. This is after all the time of the year – driving season – when oil stocks are supposed to drop. The data “revived worries about the supply glut,” according to the media. Alas, the supply glut has been getting relentlessly worse and worse and worse for two years. It has just shifted around some, with refiners trying to wind their way through it the best they can. Soothsayers out there have been prophesying time and again, for over a year, that very soon, in fact next week, the supply glut will start to unwind; that production in the US is already coming down sharply, that demand is up, or whatever…. In the end, a glut comes down to whether inventories are rising, particularly during a time of the year when they’re supposed to be falling (glut gets worse), or whether they’re falling (glut stabilizes or abates). It’s not just crude oil, but also the products that crude oil gets refined into for eventual use. 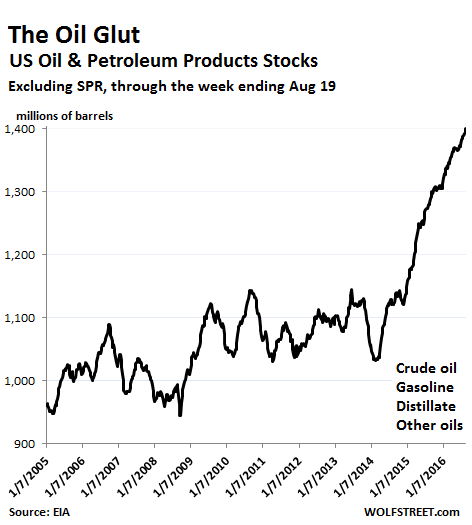 And these stocks of petroleum products have been a doozie, particularly gasoline. Distillate fuels rose by 200,000 barrels to 153.3 million barrels. And “all other oils” jumped by a total of 3.9 million barrels to 490.6 million barrels. 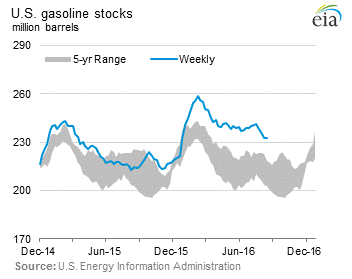 So total petroleum products stocks rose by 6.6 million barrels during the week, or 0.5%. Once again, this small-ish number, but over the period of the oil bust, total petroleum products stocks have soared by 30% and now exceed for the first time ever another huge milestone: 1.4 billion barrels. Note how, right after the Financial Crisis, petroleum products stocks began to rise and remained elevated over the years even as demand in the US was still languishing, hampered in part by the $100 price tag per barrel of oil. It was the perfect setup for the oil bust, when prices began to collapse in the summer of 2014. It’s not often that a glut forms a line in a chart where inventories shoot skyward for two years straight. Normally, something happens along the way: prices crash, companies get in trouble, the money dries up, and production plunges. At the same time, demand, stimulated by the crashed prices, picks up. And gradually the glut unwinds. Prices have crashed, companies have gotten in trouble, and many smaller ones have gone bankrupt. The industry has shed nearly 200,000 employees in the US alone. And yet, the price of oil re-surged, starting in mid-February, nearly doubling within a few months. Stock prices of oil & gas companies have re-surged too, including those of Chesapeake and others that were teetering, and they’ve been able to use these higher stock prices to bamboozle investors into giving them more money, and swap some of their debts for equity. So new money has been flowing back into the industry, and over-indebted companies near the brink are pumping all the oil they can to meet their debt payments. And the glut just hasn’t started to abate yet. OPEC, Saudi Arabia on its own, and whatever energy minister out there can talk their mouth ragged to manipulate markets into their direction and to accomplish whatever goals they might have. But this chart above is worth more than a thousand of their words, and a reminder that the glut is far from over.